Subramaniyan, A., Ilangovan, R. (2015). Thermal Conductivity of Cu2O-TiO2 Composite -Nanofluid Based on Maxwell model. International Journal of Nanoscience and Nanotechnology, 11(1), 59-62. A. Subramaniyan; R. Ilangovan. "Thermal Conductivity of Cu2O-TiO2 Composite -Nanofluid Based on Maxwell model". 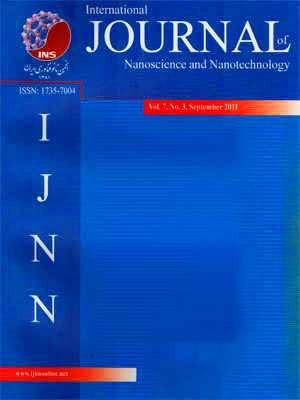 International Journal of Nanoscience and Nanotechnology, 11, 1, 2015, 59-62. Subramaniyan, A., Ilangovan, R. (2015). 'Thermal Conductivity of Cu2O-TiO2 Composite -Nanofluid Based on Maxwell model', International Journal of Nanoscience and Nanotechnology, 11(1), pp. 59-62. Subramaniyan, A., Ilangovan, R. Thermal Conductivity of Cu2O-TiO2 Composite -Nanofluid Based on Maxwell model. International Journal of Nanoscience and Nanotechnology, 2015; 11(1): 59-62. Nanofluids are colloidal suspension of nanoparticles in a base fluid and have superior thermal properties in comparison to their base fluids. Novel properties of nanofluids are yet to be explored to the highest potential. Currently extensive investigation has been done on thermal conductivity of metallic and oxide nanofluids. Composites offer the advantage of tailor made properties and fluids with nano composite can offer tunable thermal conductivities.The present work deals with investigation on thermal conductivity of Cu2O-TiO2 nanocomposites with water as base fluid using Maxwell model for different volume fractions of anophase. The thermal conductivity variation is analyzed with respect to olume fraction of each phase of the nanocomposite.also by varying volume fraction of the individual phase of anocomposites. The highest thermal conductivity was obtained for the Cu2O-TiO2 (1:9) with water as base fluid. The results depend on the shape of Cu 2O-TiO2, viscosity of nanofluid, interfacial layer thickness and size of nanoparticle due to the constraints in Maxell thermal conductivity equation.